A treaty is a written agreement between two or more parties that consists international law. The parties may be countries or other important groups. A treaty may be about any subject. Two countries might agree to stop a war, or declare war on a common enemy, or allow each other's citizens or merchandise to cross borders freely. 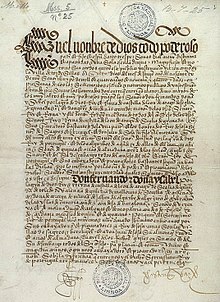 Treaties are usually used to settle disputes. The European Union is set up by treaties between most of the European nations. This page was last changed on 28 June 2018, at 03:10.